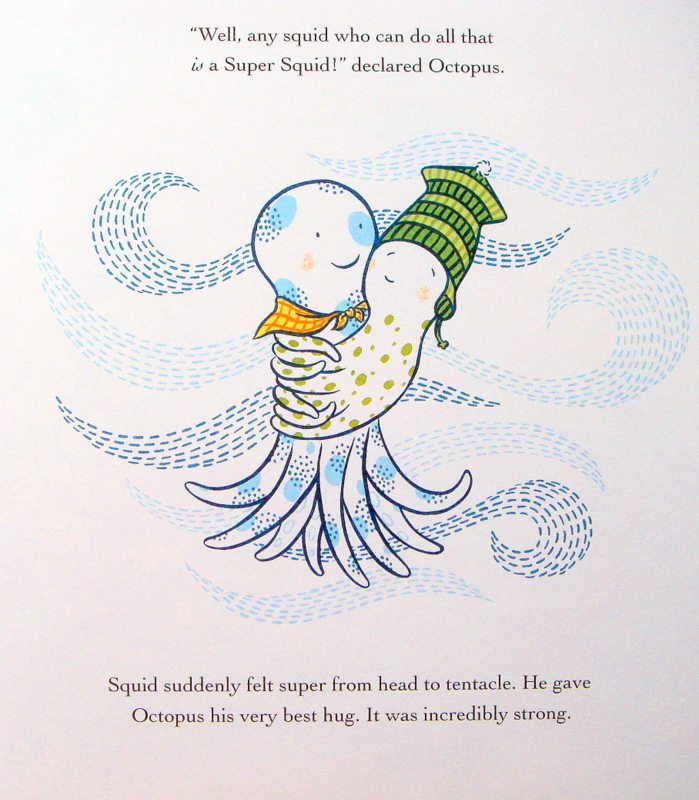 Squid and Octopus: Friends for Always—a story of friendship in four parts. Her art is richly detailed and immensely appealing. She uses bold lines, white backgrounds and a limited palette of deep pastels, achieving texture with dashes and dots: these beautiful scenes are reminiscent of “paint with water” activity books. 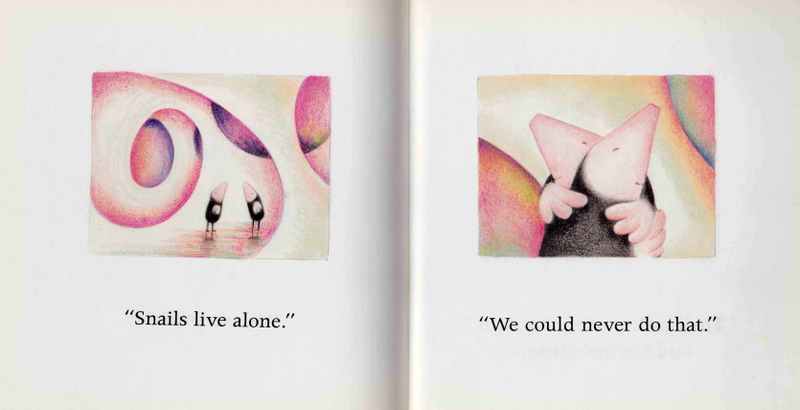 Her text is simple and straightforward; her stories of friendship belong along side such classics as George and Martha, and Frog and Toad are Friends. 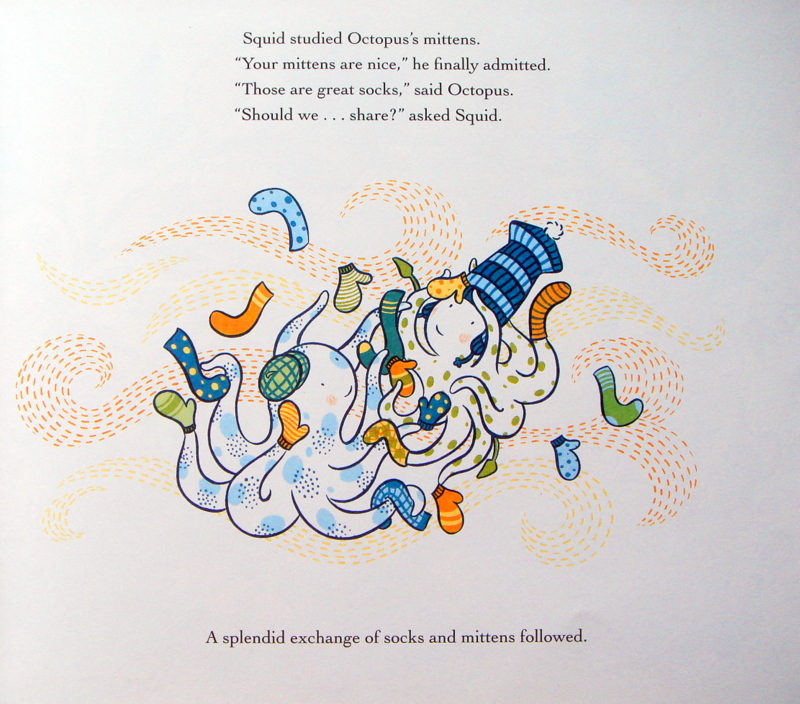 And like those favorites, Squid and Octopus contains several different stories as opposed to one continuous tale. In “The Dream” Squid is sad when he wakes to realize that his amazing dream, of being a Super Squid with super powers, was just that—a dream. Now he feels so ordinary. Then Octopus reminds Squid of all the amazing things he’s done, coming up with Tickle Mondays for instance, and Squid feels super once again. 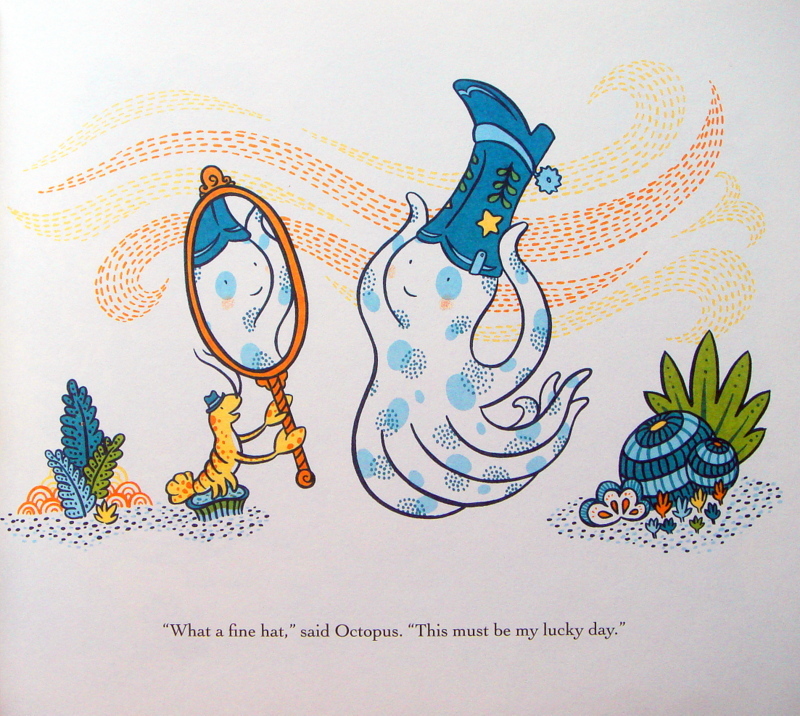 His friend Carl, a wee fish, asks the mollusk why he is wearing a flowerpot on his head. Just as Octopus is correcting his supposed gaff, Margot, a lovely starfish, asks the cephalopod why he’s filling a soup bowl with flowers. “The Fortune Cookie,” the final chapter, finds the two friends speculating on what fate the fortune may predict for them; will it be good, or bad? The mere mention of a bad fortune causes Squid enough fear to squirt ink. Squid and Octopus decide to open the cookie together and the fortune it contains couldn’t be more appropriate, or true. 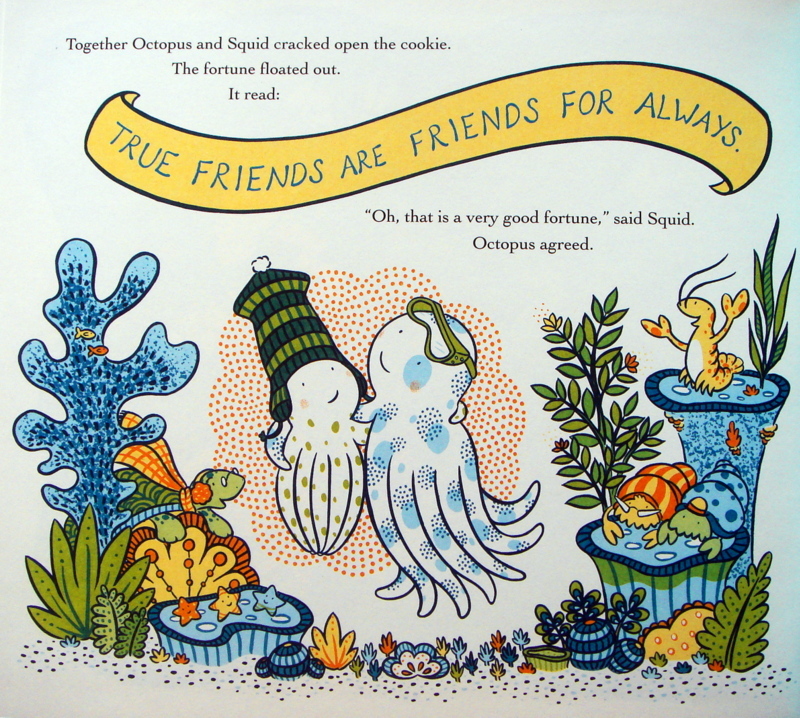 Squid and Octopus: Friends for Always is a splendid story of friendship abounding in humor and kindness. It teaches (or reminds) children that sometimes even best friends can have their difficulties but the pleasures and comforts provided by a good pal are unmatched. The Mole Sisters: Prepare to fall in love. Note: I will not normally review all the books in a series, but this series is an exception. These books are just so unbelievably adorable, and I really do think you need them all. Published by Annick Press Ltd. 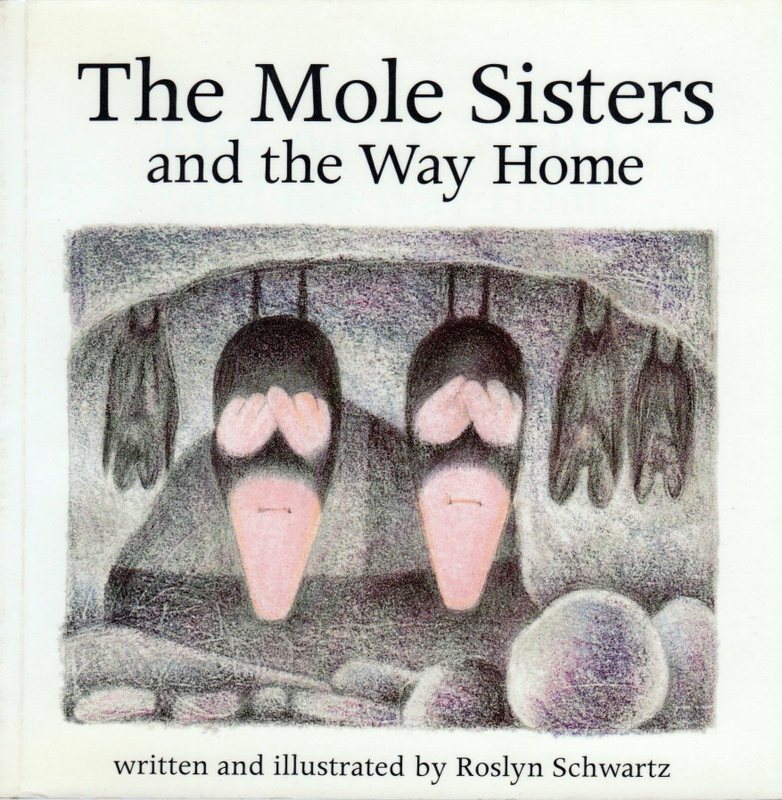 I fell madly in love when I first laid eyes on the Mole Sisters (who are never referred to by name, they are simply “the mole sisters”) and I can’t imagine anyone not feeling the same way. Actually, I just don’t want to. There are ten books in The Mole Sisters series and you will want them all. They’re small (6 in. x 6 in.) so they won’t take up much room on the shelf, and paperback, so they’re light, as in, easy to carry in your bag when you need books on the go. Annick Press published a hardcover compilation, which includes all of the stories, but I recommend against purchasing it. Incidentally, this is how I feel about almost all compilations. The page layout has been adjusted to fit this format and it alters the timing of the stories. (Don’t get me started on why a publisher would do such a thing! If books are dying it’s because publishers are killing them.) But more importantly, part of the beauty of these books is their size; they’re small, light, paperback books. Hardcover compilations are large and clumsy, they do not travel well and are just not as cozy (or practical) for reading time. 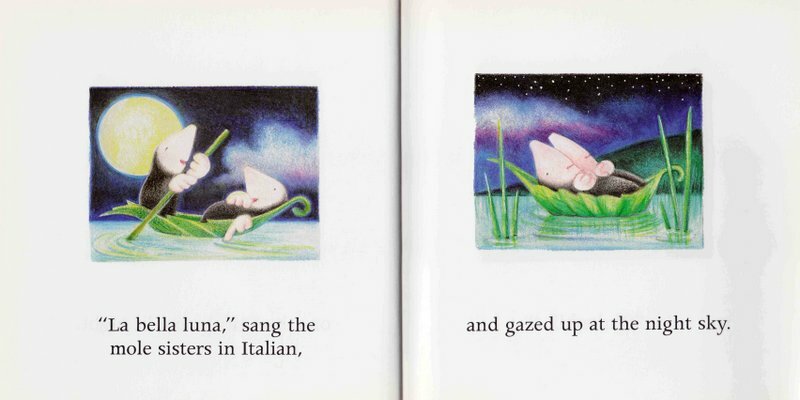 The art in these books is simply perfect; small, detailed illustrations in colored pencil, with a very crayon-y feel. The books themselves are 6 inches square with the illustrations at 3.25 x 2.5 inches, surrounded by white space. The short, simple text occupies the bottom of the page and consists mainly of conversation between the sisters, with a healthy dose of onomatopoeia. 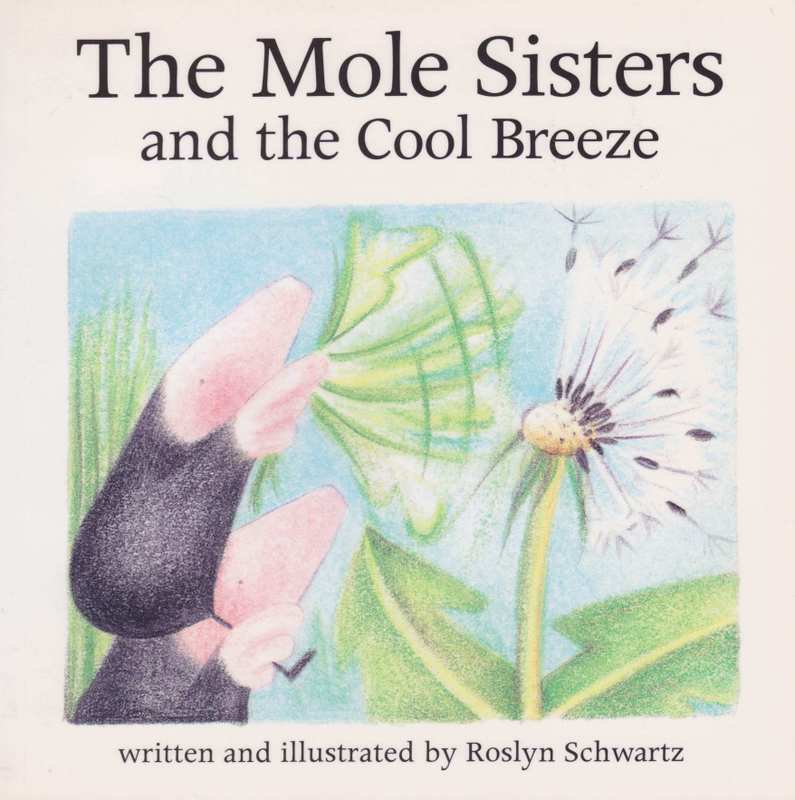 The mole sisters are all about simple pleasures, and they are always able to find something to be happy about. I think you’ll agree that their happiness is highly contagious. 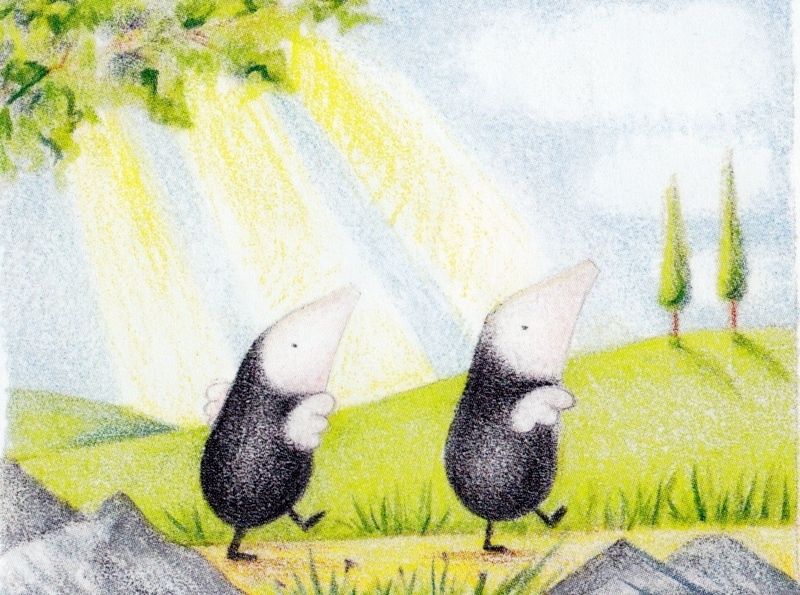 In The Mole Sisters and the Rainy Day, a rainstorm forces the sisters back to their home, which then begins to flood. Soon they come up with a brilliant idea. They dig a hole under the leak and turn their home into a spa like oasis, complete with towels and a potted plant. You will wish for your own piece of moss after reading The Mole Sisters and the Piece of Moss. It’s beautiful, green fluffy moss; the kind you see on the forest floor and think, I could totally sleep on this. And, eventually, that’s just what the sisters do. 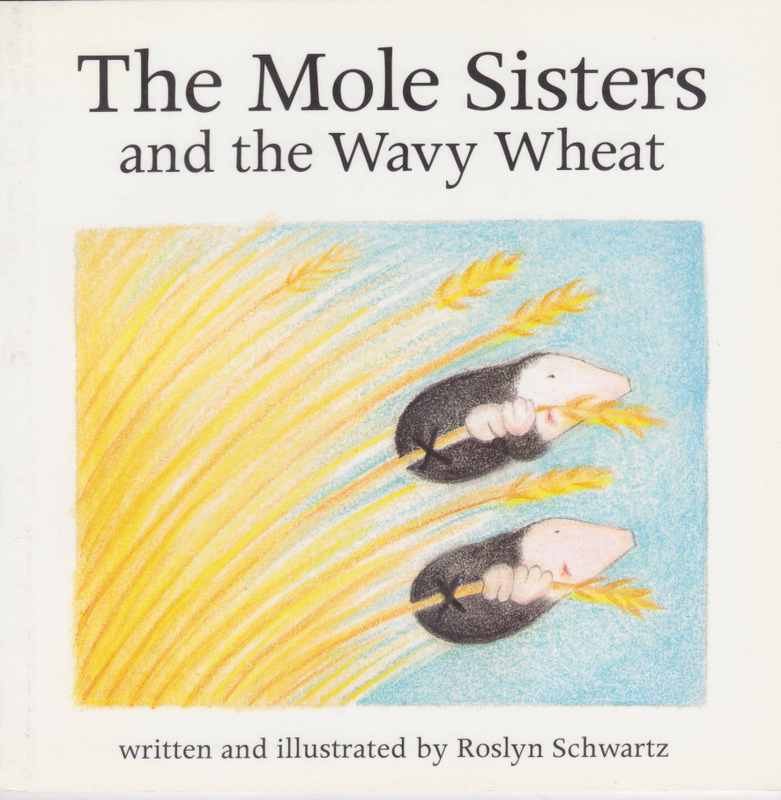 In The Mole Sisters and the Wavy Wheat, a vast wheat field is discovered when the mole sisters follow the right-hand passage coming out of their hole instead of the one on the left. Adorable adventures ensue. 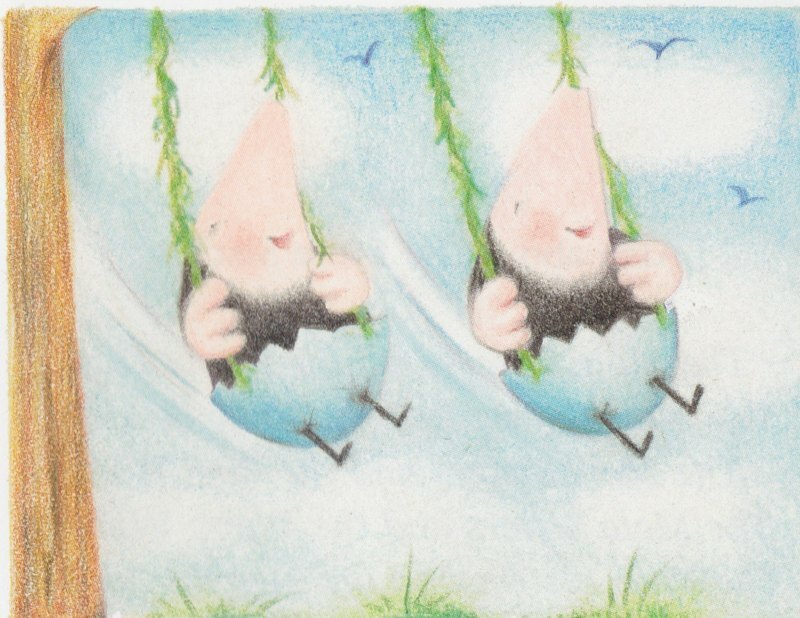 On the first page of The Mole Sisters and the Busy Bees, the sisters rightly declare, “Sometimes it’s important to do nothing.” (No kidding!) Pretty soon doing nothing is interrupted by a passing bee, which they feel compelled to follow. And, after a lovely little adventure, they go right back to doing nothing. The Mole Sisters and the Blue Egg involves the cutest swings ever conceived of, made of half of a blue eggshell and the branches of a willow tree. 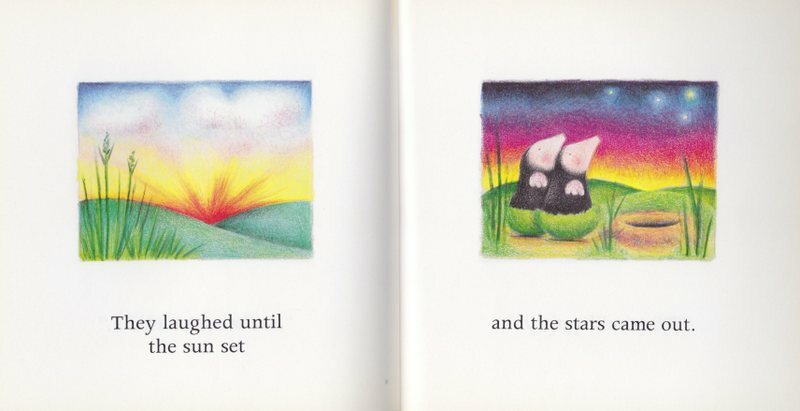 The Mole Sisters and the Moonlit Night, not only features a beautiful moonlit night, but also shooting stars, wishes, and a trip to the moon! The Mole Sisters and the Cool Breeze opens with the two divine characters lying on their backs, faces flushed. They are desperate for a nice, cool breeze and head out in search of relief only to realize that they must provide it themselves. So they take turns fanning each other with large leaves. Then they decide to fan the surrounding dandelion puffs. Soon the sisters are completely, and adorably, covered in fluff. Thankfully, that much needed breeze blows through and cleans the sisters up. 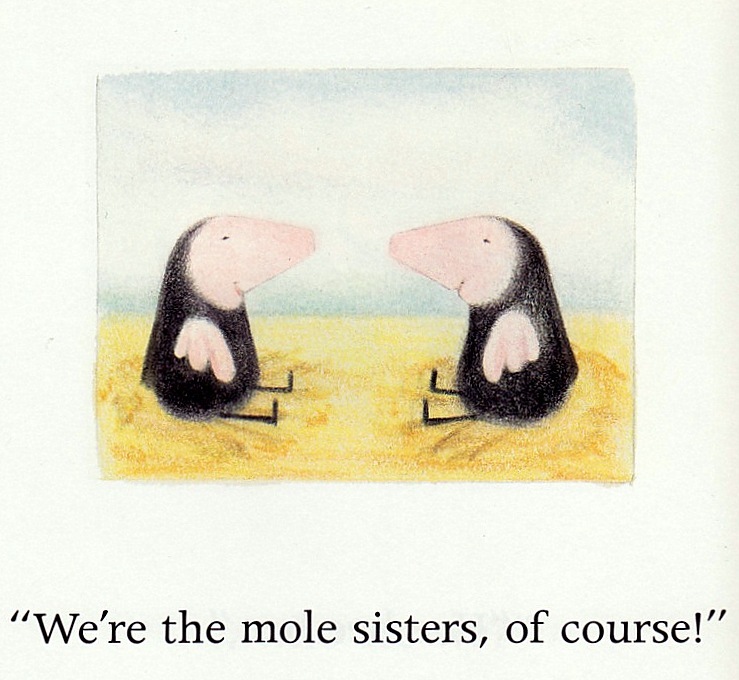 The mole sisters seem to be having an existential crisis in The Mole Sisters and the Question. Are they fish? No. Birds? Nope. Snails? 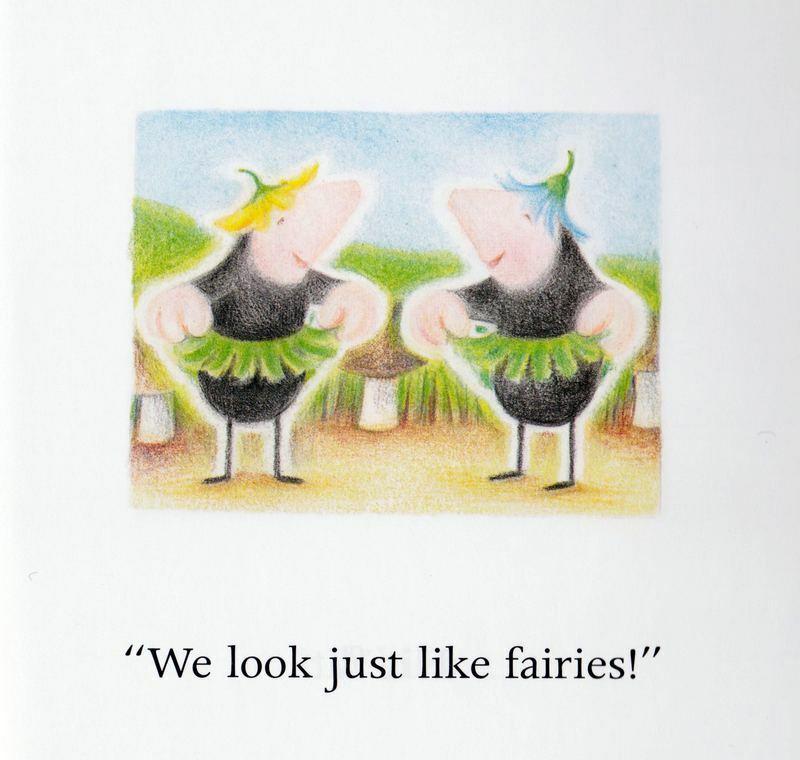 In The Mole Sisters and the Fairy Ring the sisters discover a fairy ring (which actually is a real thing; it’s a ring of mushrooms in a field). Since there are clearly no fairies about to entertain them, they decide to be fairies themselves. 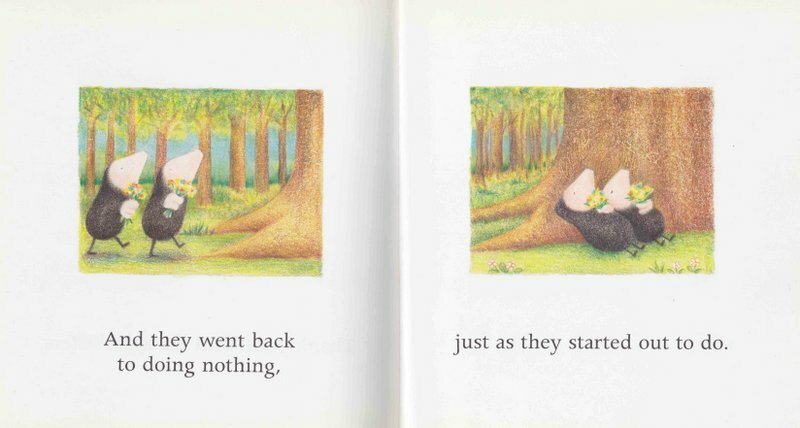 Eventually they tire of pretending and become moles once again. The sisters are headed home in The Mole Sisters and the Way Home when it starts to snow. And snow. And snow. Making their way through the drifts, they are diverted into a wonderful, magical cave, where they add themselves to some prehistoric cave paintings. Not to fret, the sisters make it home safely and warm themselves by a cozy fire. Bonus: Mole Sisters finger puppets also exist! They are nearly as cute as the books.